"A" and I come up in the evening. She has had an art installation out in the forest for about 2 years - several old law books, carved and sealed in wax, but with a couple fungi types introduced to the pages. They were mounted on the sides of old growth cedar nurse stumps. We're collecting them to be shown back in the city. I had suggested that we split out part of the stumps, so we come armed with a saw, axe and some rope. Philosophy Camp is getting started up at the house (another of the annual Smoke Farm events), but we just wave as we pass, stopping only to talk to "B" because he is on the road as we go in. We both think it is best to not disturb the philosophers. The forest is already taking on the damp of the evening, it is such a good smell. There are more of the wax blocks than I had thought. "A" has them on four different stumps, but all in the same area. We figure that these trees were turned into stumps before 1900. This is low land and not too far from the Salish Sea, so it would've been logged early and lasted longer only by chance. There are some 2nd growth of 2 to 3 ft diameters growing from some of the stumps. 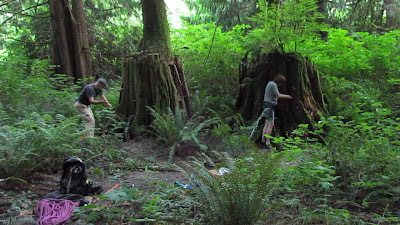 What is surprising, as we work, is the variation in the wood in the stumps. Some of it is quite rotten with a earthy smell of composting wood and organisms while large portions are still solid and firm. The axe plunges through the former, but bites firmly into the latter. I find out that the splitting off of the firm sections will take more time than we have, the sun beginning to set in a forest valley that doesn't see that much sunlight anyway. But we find and pull free some 5ft slabs that were laying on rotting wood. "A" finds that one of the fungi is finally growing on one of the wax blocks. We carry the wood back to the car. The smell of the forest rebuilding itself gets rubbed into our clothes. It stays with us in the car as we talk about art, politics, life...as we talk about how we rebuild ourselves. "A" wants people in the gallery to experience the smell. I think it is a good idea. One of Smoke Farm's main purposes is to foster discussion and the exchange of ideas. Today is the annual symposium with a half dozen speakers with wide ranging topics. Most of the guests camp out in the meadow, but last night we had a fine Thai dinner for about 30 people. I ran into an old friend, "T" who was helping with the meal. With the people that come to this place, dinners are not just a meal, but a chance to talk big ideas. The brain juices start flowing. Today, perhaps a 100 people will come. I get out of my sleeping bag when the sun reaches my tent and take my camp stove and kit to the river for coffee. It seems like the best place to do this. As I start off, I meet "B" who is going to do a bit of fly fishing. I offer him coffee and he will catch up with a cup. At the shore of the Stilliguamish - sandpipers, a yellow legs, Stellar's Jay, fish rising to the surface and the tapping of a woodpecker. I hold back one cup of cowboy coffee. It's the good stuff, but "B" will have to strain some of it with his teeth. I wonder if he is going to another beach. He should be here. "L" walks out of the woods instead, with an empty cup in hand. She is looking for her husband, who is not here. She did not see "B". Those two are probably at the same place somewhere else. I pour her the 2nd cup and we have a talk. Coincidence seems to happen with unusual frequency here. No one questions it and everyone seems to go with the flow. It is time for breakfast and then the symposium. My art buddy, "K" arrives just in time - her first visit here, but someone that will enjoy this place very much. There are a half dozen speakers....it is all, to use an overused phrase, "outside the box" thinking. The topics vary from art to climate change, the drug war, the suppression of environmental activism, relational consciousness (I'll be thinking about that one for a long time), back to art, plus an interactive printing project lead by the print shop artist in residence. It comes fast and furious, but the show is paced so that everyone can talk or refresh between speakers. My head finishes exhausted...a Thanksgiving dinner of ideas that need time to digest. Another fantastic dinner is served and everyone gets to spend time with each other until well past the stars coming out. 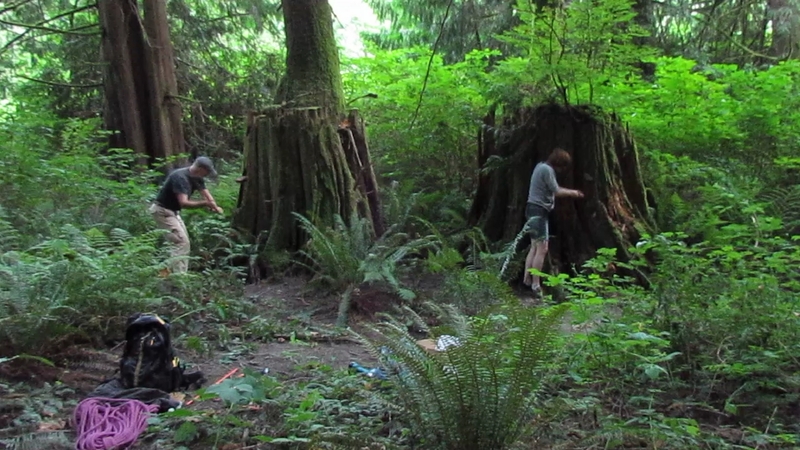 The plan is to start mapping the old growth cedar stumps. Mapping always sounds so straight forward when I think it. But, if one thinks about it too much, one might talk their self out of it. It is a game of "just do". 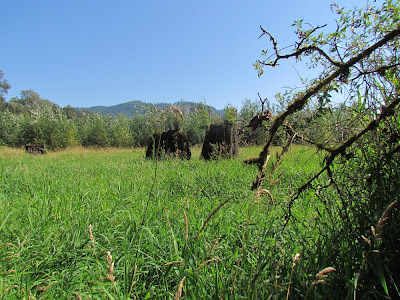 I set a datum near the old milking shed where I can sight on several objects that won't move until I am dead and buried, and then run a line down a convenient road through the young cottonwoods., my first station 80 strides out and next to a creek. This is just a warm up for me, because the road is no longer convenient and I have to head in to the trees to find the stumps. In the dense young trees my stations are now 10 or 15 strides instead of 80. That is as far as I can see. There is a bit of old beaver sign here, a few stumps with the signature teeth marks and what might be an old scent mound. At my eighth station I can see through the trees a pair of large stumps in a clearing that is up ahead. There are several more. 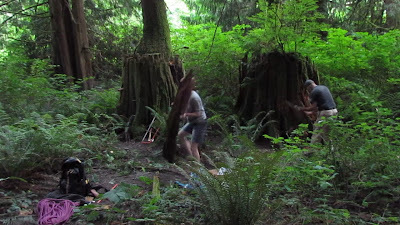 C5 no measure - 2nd growth cedar envelopes half - 2nd growth is 114 cm DBH and 35+ m tall. All of the stumps retain the springboard notches. C4 with its downhill side nearly a dozen feet high has several where the logger staircased his way to cutting height. As I pace back and forth across the clearing, in the 4-5 foot tall grass, I find a flower that is new to me (I am botanically challenged, having to repeat plant names over and over to remember them). 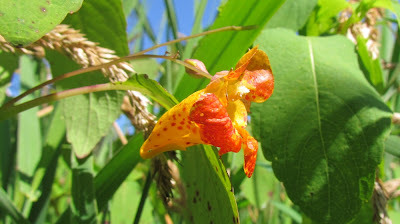 It is a jewel weed and the small flower is about the size of my first joint on my index finger - shaped like the toe of a moccasin, yellow and orange. There are many of them. 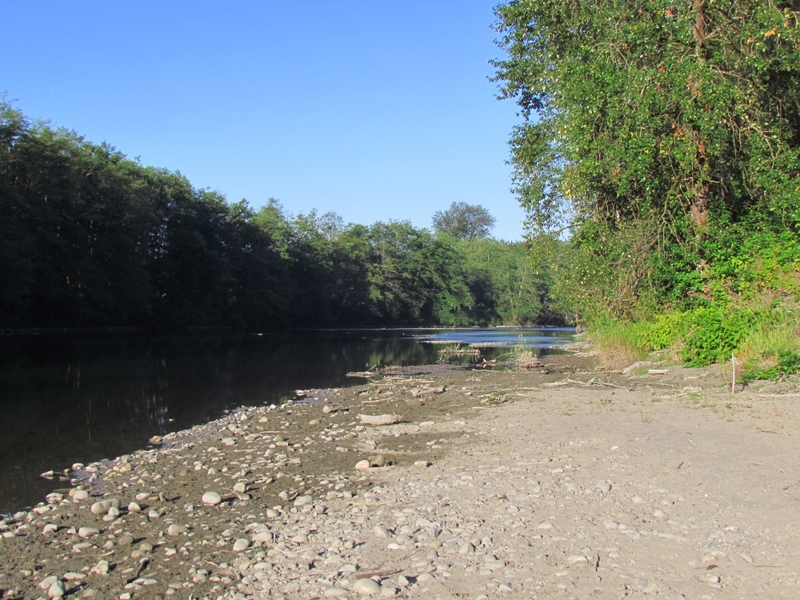 The day has been hot for this part of the country and it is time to go sit by the river. This is symposium weekend at the farm and a couple dozen people will arrive today in preparation for tomorrows full day of lectures and discussions. The core purpose of Smoke Farm is discussion and the exchange of ideas. I am seeing, in my new relationship, that it is embedded in most anything that happens here. Today's entry is rather long...it is the opener, the introduction. Most of my following writing will be much more brief. The artists have, for the most part, prepared for tomorrows festival. Volunteers have prepared and served an excellent dinner, and many of us have gathered to have a discussion about art, landscape and whatever lead by "J", who is quite good at this. "S" announced me as the Smoke Farm Artist in Residence (Smoke was the name of the family that farmed here - people always ask). The discussion is good. I wonder how the artists are responding to the environment where they will put there work. I wonder about that relationship. Following the talk, which runs 'til near midnight, "A" and I head out with a few others to see some of the installations under a near full moon. 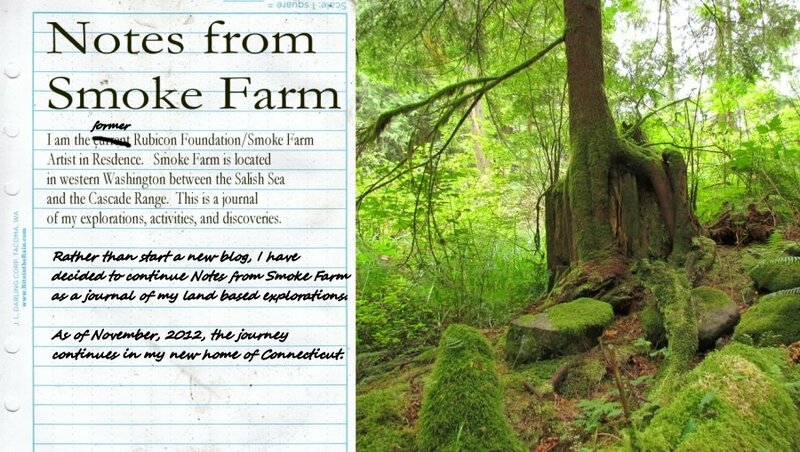 The Smoke Farm was at one time a dairy operation on the north bank of the Stilliguamish River. 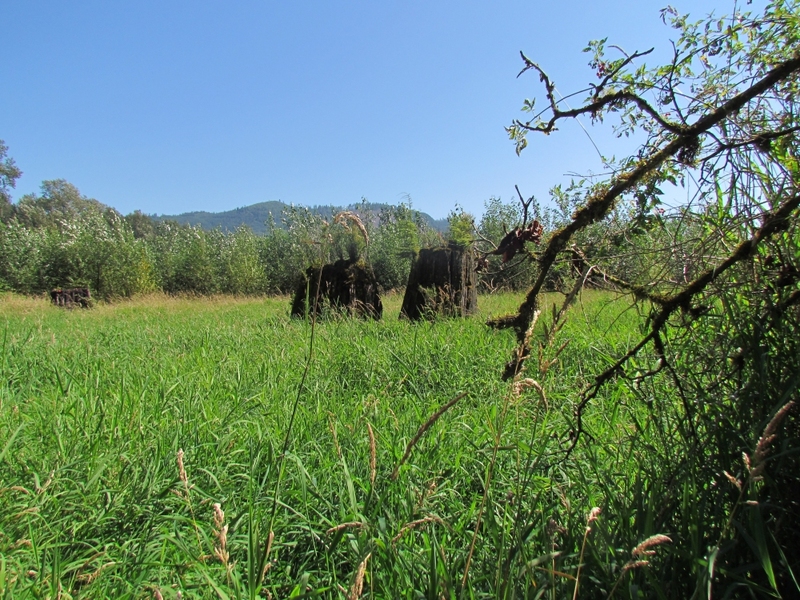 Flat ground that once was pasture, but is becoming something else, leads up to steep hillsides that were old growth cedar, then cedar stumps, then alder, and now a mostly second growth cedar. It is dense, dark and green western Washington forest. Earlier in the day, right after arriving and setting up my tent, I blasted out into the brush as I often do, compass in pocket, but no map (walk south and you hit the river). I find a dilapidated beaver dam in a near dry creek and recent gnawings. The beaver will probably return when the water is running this fall. Eventually, I busted out of the cottonwoods to find some 75 yards distant across a tall grass meadow, a machine that appeared to me, this being a former farm, as something made from a steam powered thresher. It was quite wonderful and I stayed well away to let the artists continue their work. As I walked, I found only a few more artist teams as they were very widely spaced on quite a large bit of land. In the dark, "A" and I headed toward the "threshing" machine. "A" knew her way, having been here many times as well as being one of the organizers of the festival. A ground fog had developed and was lit by moonlight. The "thresher" was fogged in and lit perfectly. It turned out to be a human powered sound machine, a large complex of cogs, chains, linkages, bellows and organ pipes. It was quite fantastic and I think the setting only made it more so. We continued on to the river leaving others to turn the large hand wheel and send out an occasional howling note. The bank of the Stilliguamish was cobbled here, and as we walked, out of the corner of my eye, I caught sight of two 40 foot long drift logs, silver and barkless, some 30 feet from the water. What caught my eye, because logs aren't that unusual, was that they were completely parallel - which is unusual. It was a mystery moment, finding something out of place in the dark with the river drowning out any noise from beyond. "A" whispered (people whisper in the dark - I suppose not wanting to disturb the darkness, unless they are warning off bears), "the colored rocks." We walked up to the logs only to have them dissolve into stones arranged by color. In fact, they were not 8 inches high, but flat. The artists had sorted and plugged the stones back into the ground according to color making a few 40 foot long stripes that seemed something else in the night...wonderful. I will not go back in daylight. This was a discovery experience and discoveries cannot be repeated. Morning comes and I make coffee and bannock for breakfast. "S" comes by to talk as I am starting to chew some bannock (fry bread). He declines to have some just as I am wondering why my bannock is so damned bitter tasting. After he leaves, I am sorting through my food bag and find that I have fried my bannock in dish soap, the soap and oil bottles being somewhat similar. It takes a bowl of oatmeal and a lot more coffee to get the taste out of my mouth. Behind me, a woman is busy sewing on something red. She is, for sure, an artist behind schedule. I offer to help sew, assuring her that I do know how. "W" and I sit knee to knee and finish sewing something that will become a huge dragonfly wing. Sewing together with someone is always a fine time...I suppose that goes back a very long way. That done, I go out and wander looking for art. I find a beautiful braided grass installation, spirals and curves with stomped flat grass floors, a fine use of the 4 to 6 foot tall grass in these meadows. A man with a numbered pin flag comes in. He is a poet and reads us a long and very fun, unbridled poem about wanting to be a dragonfly. My face hurts from smiling when he is finished. I head off down a trail and immediately find "W"s three red dragonflies. Then I sit for an excellent performance at a post-apocalyptic camp. It is very emotional, very well done. I continue and just keep finding stuff...everything is a discovery. It is one of the best art experiences I have ever had. I can see so clearly that all of the artists, whether they know it or not, for some of them have had details to attend to, are relating to the environment. They have changed my perceptions of what this space is, for the better. When I begin my work here, it will be at a different starting point than I had imagined.